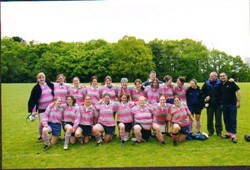 Olney Ladies RFC Midlands 2 League winners colour team line-up photograph (season not known). 19 named players in rugby kit: R. Fearnhead, T. Cartmell, A. Clarke, K. James, C .Batty, J. Rathbone (captain), A. Holden, N. Pearce, H. Woods, K. Woods, J. Haines, L. Holbourne, K. Hardwick, K. Davey, A. Roberge, N. Byast, A. O’Dell, K. Duncan, C. Swallow. Three coaches: A. Nynard, T. Hacker, P. Atkins. Taken in a field setting.